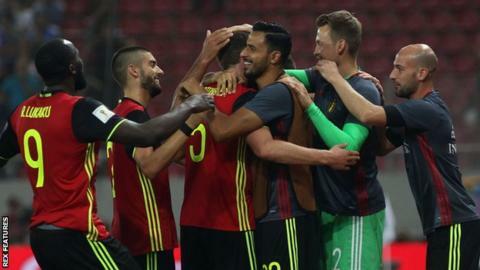 Belgium became the first European side to join hosts Russia at next summer's World Cup finals as goals from Jan Vertonghen and Romelu Lukaku gave them victory in Greece. All three goals came in a five-minute second-half period, which began with Vertonghen firing Belgium ahead. Zeca brought Greece level soon after but Lukaku scored the final goal with a glancing header a minute later. Belgium lead Group H by eight points with two games to play. The Red Devils join Brazil, Mexico, Iran and Japan in qualifying for the World Cup, with Russia automatically getting a place as hosts. Bosnia-Herzegovina have moved ahead of Greece in the race to claim a play-off spot as Edin Dzeko scored twice in a 4-0 win in Gibraltar to take them up to second place. Kenan Kodro and Senad Lulic got the other goals for Mehmed Bazdarevic's side, who have 14 points, one more than Greece. Switzerland maintained their three-point advantage over European champions Portugal after both claimed wins on Sunday. An own goal from home keeper Andris Vanins, a strike from Blerim Dzemaili - who had earlier missed a penalty - and a successful spot-kick from Ricardo Rodriguez gave the Swiss a 3-0 win in Latvia. Portugal took advantage of Tamas Priskin being sent off to claim a 1-0 win in Hungary, with Andre Silva scoring the goal. Match ends, Greece 1, Belgium 2. Second Half ends, Greece 1, Belgium 2. Sokratis (Greece) wins a free kick in the defensive half. Kevin De Bruyne (Belgium) is shown the yellow card for a bad foul. Foul by Kevin De Bruyne (Belgium). Anastasios Bakasetas (Greece) wins a free kick in the defensive half. Hand ball by Anastasios Donis (Greece). Attempt saved. Dries Mertens (Belgium) right footed shot from the centre of the box is saved in the top centre of the goal. Assisted by Eden Hazard. Substitution, Greece. Apostolos Vellios replaces Konstantinos Fortounis. Substitution, Belgium. Leander Dendoncker replaces Marouane Fellaini. Corner, Belgium. Conceded by Georgios Tzavellas. Substitution, Greece. Anastasios Bakasetas replaces Giannis Maniatis. Attempt saved. Romelu Lukaku (Belgium) left footed shot from outside the box is saved in the centre of the goal. Assisted by Thomas Meunier. Corner, Greece. Conceded by Nacer Chadli. Georgios Tzavellas (Greece) wins a free kick in the defensive half. Kevin De Bruyne (Belgium) wins a free kick in the attacking half. Foul by Konstantinos Fortounis (Greece). Corner, Greece. Conceded by Thomas Meunier. Yannick Carrasco (Belgium) is shown the yellow card for a bad foul. Goal! Greece 1, Belgium 2. Romelu Lukaku (Belgium) header from the centre of the box to the bottom left corner. Assisted by Thomas Meunier with a cross. Substitution, Belgium. Eden Hazard replaces Mousa Dembélé. Goal! Greece 1, Belgium 1. Zeca (Greece) left footed shot from the centre of the box to the bottom left corner. Assisted by Georgios Tzavellas with a cross. Attempt missed. Alexandros Tziolis (Greece) right footed shot from outside the box misses to the left. Assisted by Charalampos Lykogiannis. Goal! Greece 0, Belgium 1. Jan Vertonghen (Belgium) left footed shot from outside the box to the bottom left corner. Assisted by Mousa Dembélé. Attempt missed. Anastasios Donis (Greece) right footed shot from outside the box is too high following a corner. Substitution, Greece. Charalampos Lykogiannis replaces Konstantinos Stafylidis. Corner, Greece. Conceded by Toby Alderweireld. Offside, Belgium. Marouane Fellaini tries a through ball, but Thomas Meunier is caught offside. Foul by Marouane Fellaini (Belgium).